"Pushy" loads, has rope halter training, and has excellent ground manners. She will make a great hunter or dressage mount. 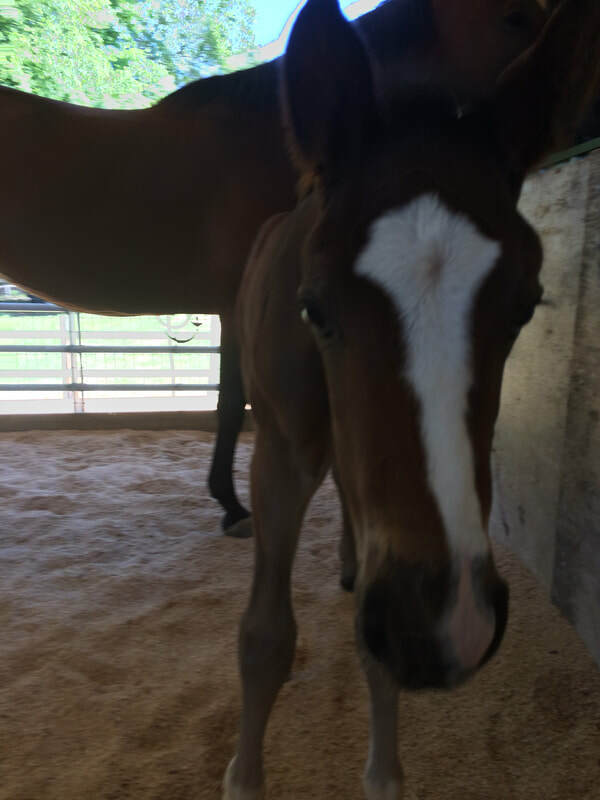 She has been started under saddle and is doing great. Price will increase with training. 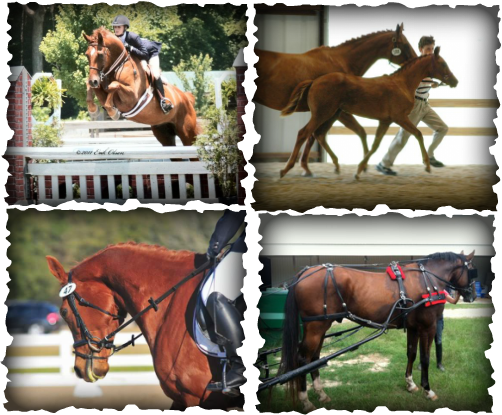 Porter, pictured bottom right, is a big handsome fella at 17.3 hands, bay with tons of chrome. His beautiful expressive eyes and puppy dog personality would make anyone fall in love. 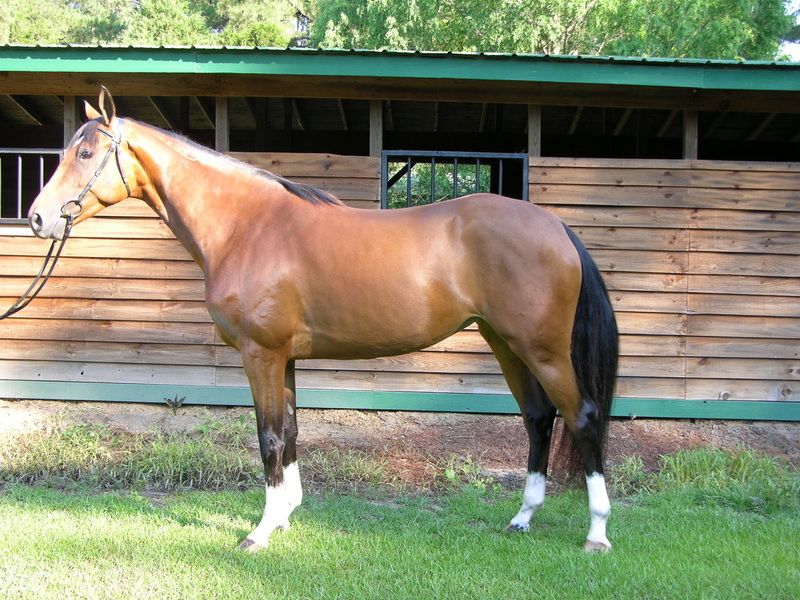 Trained in dressage, hunter, and driving, he is very versatile like his dam Harley. Graefliche Melodie aka Harley is a 16.1 hh chesnut mare with a floaty trot and a steady canter with a big stride. A very versatile mare, she has dressage and jumping training and would be suitable for a young rider or amateur looking to excel in the dressage arena. Her American Hanoverian Society inspection scores are as follows: Head, Neck, Confirmation, Typiness/Femininity, Impulsion/Elasticity, Walk, and Overall Impression all received scores of 7. Saddle position received a score of 8. She has successfully put out five gorgeous babies over the past 12 years. Payton is pictured in the top left photo. He is currently showing in the Adult Amateur hunter division. He was very easy to train from birth to age three when he was sold. Latte is an 11 year old registered Oldenburg by Landkonig. This bay mare has a unique star/stripe/snip face marking and 4 white stockings. A joy to watch, Latte has lovely fluid trot, canter and a lot of scope to her jump. She is a very well mannered, sweet horse. If you want to see a gorgeous horse, look no farther. She foaled for the first time in 2016 and produced a spectucular filly who has the same lovely gaits and markings. Lakota was also bred to Pablito and is due in April. Lakota is absolutely marvelous. She is consistent over fences and at 16.1 hh she can carry any experienced rider over a course. She has competed first level dressage and has been used in a riding program for the University of South Carolina.